At the end of a long private drive, a spacious country house offering very comfortable accommodation. Relax in the gardens, swim in the large pool, enjoy an evening barbecue, read undisturbed under an ancient olive tree or walk along the grounds picking fresh produce such as oranges, lemons, grapes, pomegranates, figs, or avocados; and you will find yourself unwinding completely in this authentic Andalucian finca. Situated in an idyllic rural setting the property is nestled in the fertile Gualalhorce valley, and the surrounding lush green hills create a magical backdrop that could only be Spain. You will enjoy complete privacy and yet it is the ideal base for taking part in a huge variety of nearby activities such as golf, horse-riding, tennis, trekking, paddle tennis, clay pigeon shooting, quad bikes, motorbike enduro racing, coarse fishing, day tips to Tangiers in Morocco, bullfighting, and beach sports - and exploring local markets, fiestas, 'ventas', restaurants & bars. We love our finca and are really delighted it gives so much pleasure to others when we are not able to enjoy it ourselves. We chose it after many years of searching because it is the most calming, relaxing, and beautiful place we could find, because the views of the gentle valley and surrounding mountains is fantastic, and because we find the 100 olive trees and the 250 orange, tangerine, avocado trees an incredible boon. And whilst we are there we are totally secluded and away from other tourists, yet we are 20-25 minutes from an international airport and 5 minutes from a beautifully kept typical Spanish town. En-suite to bedroom 1 with WC, vanity basin, bidet, jacuzzi bath & separate shower. En-suite to bedroom 2 with WC, vanity basin, bidet, bath & shower over. Third independent bathroom with WC, basin, bidet, bath & shower over. Additional separate WC. Oil filled electric radiators available for every room in the winter. Large (56sq.m approx) reception room with modern sofas and armchairs, desk, and plenty of storage. 55" Smart TV (Sky, YouTube, Netflix), CD player & iPod dock. Large fitted kitchen with stainless steel hob and oven under, extractor, new dishwasher, large fridge. Kettle, toaster and microwave. Electric juice extractor for making orange juice or lemonade from the finca’s own trees. Planted and well tended, with extensive lawned area, leading to surrounding citrus and olive groves. Completely private, fully fenced. The nearest golf course is Lauro Golf, within a 5 minute drive (27 holes, multiple sports and other activities available). There are more than a dozen other clubs within 15 miles, including Alhaurín, Mijas, La Cala, El Chaparral, and the Club de Golf Malaga Parador championship course. Outside only where ashtrays are provided. Outside: The property is gated and fenced for security. The house is surrounded by 200 sqm of terracing. The front terrace overlooks the garden and pool area and has a table and chairs under a parasol for shade, and space for the table tennis table if you choose. The back terrace overlooks the valley and boasts a ‘chillax’ area seating 8-10 on modern rattan furniture at one end and a marble-top table seating 8 and a modern gas BBQ at the other. One terrace is sunny in the morning and the other in the afternoon, ensuring there is always somewhere to sit to suit your needs, and both have peaceful private views of the surrounding hills. The 12m x 5.5m pool has a modern salt filtration system (non-chlorine), kinder to skin. It has an additional 2m x 2m area of wide, shallow steps, ideal for sitting on. 8 high spec sun-loungers are supplied. Utility Room: Washing machine. Second fridge-freezer (for the all-important cold drinks storage!). Iron and ironing board. Cleaning / Towels / Linen / Maid service: Linen is provided and property is cleaned between lets (and more frequently at extra cost). Please bring your own beach towels. Other: Large (20sq.m approx.) dining room with dining table for 8-10, modern sofa and sideboard. Window to garden and access to back terrace with BBQ. This villa is lovely and spacious, plenty of room for our family of 6. Peaceful and quiet around the private pool, which is kept very clean. The views are amazing while watching the sunrise on the terrace. Would definitely recommend staying here we will be visiting again soon. Thank you so much for your review. We are extremely happy that you enjoyed your holiday at our Spanish home and look forward to welcoming you again soon. The villa is big enough to accomodate 8 adults comfortably - no bathroom queues, a big dinner table to fit us all, a pool where the more sporty people could even do laps and plenty of space to lie in the sun. Separate fridge for the drinks was also greatly appreciated. The location is perfect - remote enough to be completely private, but close to towns and sights. Being the more adventurous kind of tourists we took several long day trips, including Malaga, Ronda, Gibraltar and Tangier, but always ended the day with a barbecue and pool party at our lovely villa. We also enjoyed the fresh produce from the grounds. Although the oranges were out of season, we still had limes (and an occasional raw orange because we're not good at recognising fruits) for coctails, the sweetest tomatoes and fresh basil for salads and some heavenly figs. Some have mentioned the lack of air conditioning, but for us it wasn't an issue at all. Although it was 37 degrees outside on some days it was still cool indoors, so we didn't even need the fans. Just have to remember to keep the blinds closed during the day. The only downsides I can list is the constant barking of dogs with an occasional donkey joining in. Plus we had trouble locating the clothes rack to dry our laundry before the very last days of our stay. Neither of these things stopped us from having the most amazing time. 8 of us enjoyed our time at the property for 10 days, and each day was brilliant. Some of us enjoyed the villa and lounged in the various lounging areas, some of us spent all day in the pool and others went on walks to the surrounding countryisde and villages. Everyone was blown away. You won't be disappointed. We are glad you had a great holiday and enjoyed staying in our Finca. Thank you for your review. excellent property with great facilities. Fantastic location and we'll maintained and kept. We would not hesitate to stay here again. 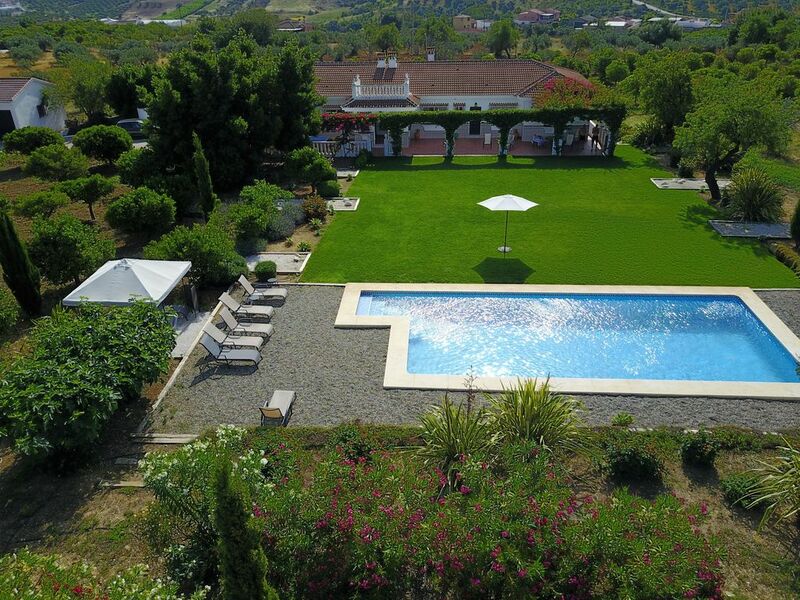 Whilst the property offers great facilities and privacy it remains within easy striking distance of nearby restaurants, supermarkets and bars and an easy comfortable drive to the coast,Malaga and easy access via a great motorway system to be able to reach Saville, Grenada and other major cities, sites and resorts. we were extremely impressed and satisfied with the property, its grounds, the surrounding area and the district. We had total privacy, with fantastic facilities,completely catered for in all departments as in furnishings,comfortable bedding,luxurious gounds, and within very comfortable striking distance to the lovely town of Al Haurin el Grande, with all its traditional Spanish restaurants and local history. We used the tourist board office for some advice on travel and the whereabouts of venues that we wished to attend and they could not of been any more helpful. Thanks for your review. We're glad that you had a great holiday and enjoyed our finca, it's grounds and the surrounding area. September is a lovely time of year to visit the south of Spain. This villa is a dream. I stayed here for 3 days, there are so many little things that made this holiday special. The weather, the villa, the grounds, the pool, the landscape and the fruit was just beautiful. Highly recommended. The coast is about 20 minutes drive and there are beaches at Torremolinos where the sand is fine, the beaches clean and the seawater crystal clear. Parking is provided and there are numerous places to eat and drink on and alongside the beach, some are 'beach clubs' with waiter service and music. For the more energetic there are plenty of beach sport amenities available. Malaga Airport is about 25 minutes’ drive away and car hire is essential. The ‘pueblo’ of La Alquería is about 3 minutes’ drive away and has two bars/restaurants and a shop. The towns of Alhaurín El Grande and Alhaurín de la Torre are 7 & 10 minutes’ drive away respectively. They have charming plazas, white washed houses and narrow winding streets, numerous bodegas, cafés, tapas & late-night bars, & traditional Spanish restaurants, as well as supermarkets, banks, doctors, etc. Enjoy their frequent fiestas & festivals (flamenco, jazz, Holy Week, etc.) & local cuisine. Plaza Mayor Shopping centre is about 25 minutes’ drive away and has a wide selection of shops such as Zara, H&M, Levis’, etc., as well as bars and a multi-cinema complex and bowling alley. Booking Notes: A non refundable deposit of 50% is payable to secure your booking with the balance payable 8 weeks prior to arrival. A refundable security deposit of £350/380 Euros is also required prior to arrival. Payment for a cot or highchair will be required on arrival at the property. Changeover Day: Please contact owner.